In today’s fast-paced global economy, we need to innovate to stay relevant and for our businesses to thrive. There’s constant talk about the significance of innovation—what it is and how we’re striving for more of it. But something is missing. The definition of innovation is often vague—or at least very different depending on the context, industry, or landscape. And even when we can agree on some kind of definition, there’s no standard, accepted way to measure the results of innovation. So how can we say we’re innovative or a leader in innovation if we can’t measure it? Let’s start by defining innovation. In its simplest form: Innovation is something new or enhanced that creates real value for customers and stakeholders. Whether we’re in a for-profit business, a not-for-profit, government agency, or other organizational model, we all have customers/members, and we exist to provide value for and serve our constituents. So for the discussion in this article, innovation is about creating value for our customers and stakeholders. Now let’s look at some ideas for how you as financial professionals can succeed. A CASE OF YIN AND YANG? The role of the CFO continues to evolve. You’ve heard about it via the IMA® (Institute of Management Accountants) Competency Crisis website (http://competencycrisis.org), and you feel it every day. As senior finance and accounting professionals, you’re key players at the table, balancing strategy with execution to achieve results. But what should your role around innovation be? In two words, innovation governance. Innovation governance sounds like an oxymoron, doesn’t it? The first time those two words came off my lips, in that order, it just didn’t feel or sound right, even though my own professional background contains both governance (in my early finance and accounting years) and innovation (in my later years of running businesses and serving on executive teams). Looking back to when I’ve led and executed successful innovation programs, I realize more and more that innovation succeeded because of good governance. Random great ideas and epiphanies don’t need governance. But systematic, holistic, continuous innovation from a multitude of sources in your business and in your value chain requires and thrives with governance. Consider this quote by New York City-based marketing and advertising consultant John Emmerling: “Innovation is creativity with a job to do.” If you think about it, that really describes innovation governance: You need to be creative and ideate new solutions, but you must execute them with discipline to achieve the value. Put simply, you need both sides of the equation. You may ask yourself, “Wouldn’t governance stifle innovation and creativity? Isn’t that the problem with big companies—that they have too much governance and not enough innovation?” On the flip side, maybe you’ve worked really hard to put appropriate and prudent governance in place, and now someone’s telling you to combine it with innovation. That just doesn’t make sense! Ten years ago, 53% of respondents had “little or nothing” to do with leading or supporting innovation. Another 24% were only “somewhat” involved. Today, only 28% of respondents said they have little or nothing to do with innovation. Another 41% are “somewhat” involved, and 26% are “often” involved. 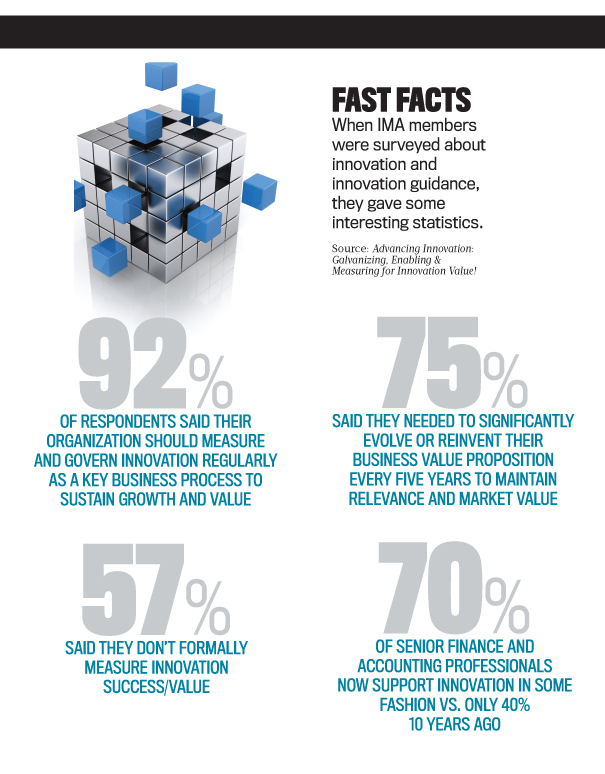 The pendulum has swung, and 70% of senior finance and accounting professionals now support innovation in some fashion vs. only 40% 10 years ago. Looking into the near future (the next one to three years), it’s likely that only less than one in five of you won’t be involved in innovation. And the percentage of those who will be “somewhat” or “often” involved will probably rise to greater than 70%, with the “often” involved group expected to leap to 38% from a mere 11% just 10 years ago. Senior finance and accounting professionals, especially CFOs, need to get comfortable with the growing trend of supporting, managing, and leading innovation. The success of your businesses and the value you bring to the market for your customers clearly depend on it. Innovation governance runs through all of these areas and should be accounted for in each theme. The areas talk about new changes and challenges in your markets (Globalization and Technology) and how to effectively lead and govern amid them. They talk about a need for governance (Regulation, Risk, and Reporting), but in a balanced sense, so that you make good decisions and don’t create cumbersome systems and requirements. And they talk to strategy and evolution (Transformation, Stakeholder Management, and Strategy) and how you need to lead and strategically evolve your organizations to be relevant and value-creating entities for your customers and stakeholders. As you manage your talent pools and capabilities, and even plan for your own succession, you need to be diligent and broad in your thinking about what core and evolving skills are needed in order to serve as CFO for today’s companies. At least four million people are familiar with Tom Rath’s book, StrengthsFinder 2.0. You may also be familiar with the related work, First, Break All the Rules: What the World’s Greatest Managers Do Differently, by Marcus Buckingham and Curt Coffman. In one oversimplified statement, these works are about individuals recognizing and capitalizing on their strengths vs. focusing on fixing their perceived weaknesses. When you look at the StrengthsFinder tool’s 34 themes, you can quickly find ones that feel comfortable to senior finance and accounting professionals and, while perhaps stereotyping a bit, help make the case for why you should and need to help support and drive innovation value. ANALYTICAL. “Prove it. Show me why what you’re claiming is true.” You know how to question people and get answers. You look for patterns, and you look for facts. You aren’t afraid to dig in. DISCIPLINE. “Your world needs to be predictable, ordered, and planned.” You like structure, processes, and routines. You live in an orderly world. A world without discipline is chaos! Leverage: This skill makes you an excellent facilitator of innovation programs and overall governance. You can bring discipline and structure to different channels of innovation—as long as you don’t overengineer processes and make them cumbersome. Through this discipline, you also bring a level of credibility and trust that ranges from the executive leadership team to all employees. Don’t underestimate the trust you can bring to the table—and how with that trust you can get things done faster to create value faster. FOCUS. “Where am I headed? Your focus is powerful because it forces you to filter.” You receive huge amounts of data and information. You have to find the needle in the haystack to make sense of things, so you’re generally excellent at focusing and filtering. You’re a filtering machine! Leverage: When innovators come forth with ideas, give them a focus. Take this sailing analogy, for example: When you innovate, you tend not to sail straight from point A to point B. You tack back and forth to ultimately get to your destination. That’s the iterative nature of innovation. You use your skill of focus to keep innovators within meaningful boundaries so they keep making forward progress and ultimately get to the goal. SIGNIFICANCE. “You want to be heard, recognized, and listened to.” You’re a professional: a CMA® (Certified Management Accountant), a CPA (Certified Public Accountant), and/or a CIA (Certified Internal Auditor), among others. You want to be—and need to be—credible. You’re ethical. You want to know that you’re significant and have significance (this may sound vain, but it isn’t; see StrengthsFinder 2.0 for a more detailed explanation). Leverage: I believe many people who thrive on innovation and being innovative thirst for significance. They want and strive for all the same things you stand for. Give them a taste of what that responsibility looks like, and mentor them to get there. When you have achieved some level of significance in your career, turn around, look behind you on the ladder, and lend a hand to help someone else so they, too, can climb higher. STRATEGIC. “…enables you to sort through the clutter and find the best route. 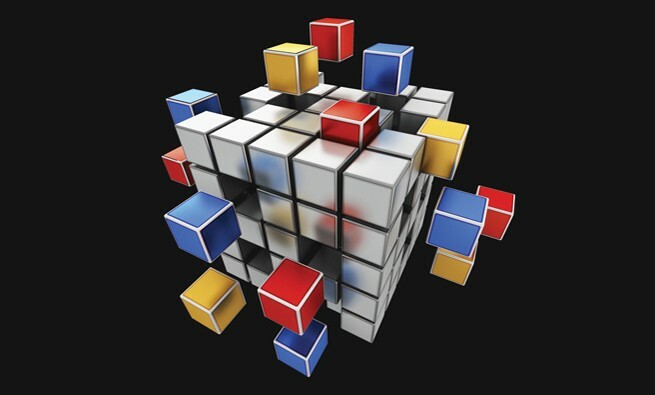 This perspective allows you to see patterns where others simply see complexity.” Many of you who are reading this article have risen to a senior level and have become more strategic and wise through your experiences than when you started your career. You have the ability to dig into the details and find answers. That said, you also know how to step back and see the forest. Leverage: When you’re leading or driving innovation efforts, look for the forest, not the trees. Be strategic and dive into the details, but in a way to advance a project, not question it. Did these five themes describe you? If you answered “Yes,” you’re definitely in a position to be driving and supporting innovation efforts. These inherent abilities and strengths make you exceptionally qualified and positioned to be an innovation leader and a supporter of innovation. Sometimes when people have a special process or recipe for how to achieve success, they call it their “secret sauce.” You could also call the secret sauce to innovation success, Innovation Elixir. Why? Because when you concoct an elixir, there are a few basic premises. One, an elixir has certain base elements that must be included or it won’t work. Two, the elements must be mixed in the appropriate proportions, but those proportions change from time to time and under different circumstances. Three, no two elixirs are exactly the same—like that favorite culinary dish you crave that has been passed down through three generations. Of course there’s a base recipe for this favorite dish, but each chef puts his or her own special twist on it. Creating an innovation elixir to drive innovation value at your company is exactly like this. It has some required basic elements, but then you need to change the proportions of the elements and add a few specific ingredients of your own to achieve the ultimate potion that will work in your business, in your industry, and in your current business landscape. Element One: Galvanizing. This first step in your journey toward innovation success is setting the appropriate tone at the top. It includes ensuring your culture is conducive to innovating (such as giving permission to fail) and having buy-in from executive leadership as well as your employees. What does “galvanizing” look like? Clear your mind, and consider the picture this story paints. Think of Achilles from Greek mythology. A key character in Homer’s The Iliad, Achilles was a Greek warrior in the Trojan War where his most notable feat was the slaying of the Trojan hero, Hector, outside the gates of Troy. When Achilles was born, his mother, Thetis, tried to make him immortal by dipping him in the river Styx. He was left vulnerable, however, at the part of the body by which she held him—his heel. Aside from his heel, he was in essence “galvanized” for protection. But he was also galvanized for success. Now imagine “galvanizing” your business with a pro­tective coating against things that could make it rust or deteriorate: new competitors, hard-line suppliers, a rapidly changing workforce, political instability, or anything else that could cause you to wobble off course. You also will be galvanizing your workforce to be innovative. Take a page out of The Iliad. Prepare your business for innovation value success by protecting it from failure and ensuring its win in battle! As a leader, you need to lead and set up the organization for success by putting in multiple innovation “channels.” What’s a channel? It’s simply a way in which you’ll solicit, collect, evaluate, design, implement, and monitor innovation activity. Some of the channels with which you’re likely already familiar are open submission, fellowships, crowdsourcing, and business challenge events. You need multiple innovation channels because all businesses, industries, employees, and leaders are different. They’re at different levels of business maturity and have different struggles to deal with. The key is to find channels that will work within your environment and that fit within your culture. Element Three: Measuring. The last element of your successful innovation elixir is measurement. Remember the old adage, “If you can’t measure it, you can’t improve it”? This is a key part of innovation governance: You have to be able to measure your results. Why? Because you want to continuously move the bar higher and know that you’re indeed creating innovation value, not just innovation activity. Yes, you have to be willing to fail, but this is coupled with an attitude and mantra of “fail, but fail fast and learn something from it.” And you also need to measure results and talk about improvement with your employees, customers, and the market. You can have a meaningful discussion around innovation value creation with Innovation Value Score (IVS), which uses a balanced scorecard (BSC) framework to help analyze, measure, and drive the creation of innovation value. 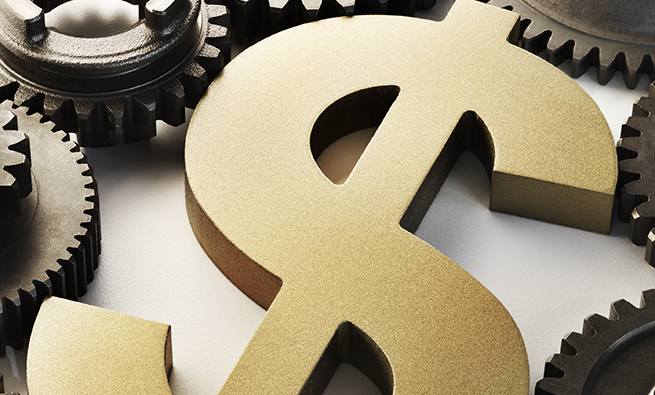 Using a BSC construct allows for an easier implementation of IVS because many finance and accounting professionals have long been familiar with the BSC and its rationale. And while there’s no perfect metric to use to measure innovation success, IVS looks at a balance of indicators, correlates those indicators to your business strategy, and, most important, points to meaningful action. Keep in mind: IVS isn’t just about measurement; it’s about overall innovation value creation and management. While IVS may not be perfect, it will be directionally correct so you can have a meaningful dialogue and strategic discussion around innovation within your businesses, your industries, and your local and global economies. You might be wondering, “Why model IVS using a BSC?” The BSC was created as a way to measure and manage a business. It was intended to be a measurement and management system, not just a calculation or ending point. In innovation, IVS has the same goal: to be used to manage a business’s entire innovation value creation agenda, not just to calculate a result and move on to the next task. Additionally, if you believe that innovation governance belongs in the Office of the CFO and that senior finance and accounting professionals should be leaders in innovation governance, then why not choose a familiar, universally accepted tool and methodology? Put simply, there’s less value and more time involved in learning an entirely new methodology, debating it, and gaining its acceptance. You already have a tool in your finance toolbox that, with some adjustments and modifications, can serve your needs in innovation measurement and management and in overall innovation governance. So why not use it! In fact, three of us sat down with Robert S. Kaplan, co-creator of the balanced scorecard with David P. Norton, and discussed the overall model presented here, how the role of the CFO is changing, and how we financial professionals need to support and drive innovation in our businesses. His suggestions and comments were essential to the base construct of this innovation measurement system, which utilizes a BSC framework. 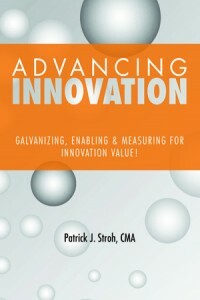 Kaplan also is writing the foreword to the Advancing Innovation book. When Kaplan and Norton published The Balanced Scorecard: Translating Strategy into Action in 1996, they followed that initial work with research, observations, and recommendations around the need to have “strategy maps.” If you talked with them directly or read their books, they would tell you that Strategy Maps: Converting Intangible Assets into Tangible Outcomes (2004) and The Strategy-Focused Organization: How Balanced Scorecard Companies Thrive in the New Business Environment (2001) really should have come out first in their body of work, then been followed by The Balanced Scorecard. Why? Because you get what you measure, and, while a balanced scorecard of metrics makes great sense, you can still be measuring the wrong things. Therefore, it’s critical that you have your strategy articulated and then tied to specific metrics and initiatives. Then you’ll be measuring what’s important and what you’re strategically striving toward. In Strategy Maps, Kaplan and Norton say, “The value proposition defines the company’s strategy for the customer by describing the unique mix of product, price, service, relationship, and image that a company offers its targeted group of customers. The value proposition should communicate what the company expects to do for its customers better or differently than its competitors.” Then they name four business archetypes of value propositions, which are very close to those formulated in some APQC (American Productivity and Quality Center) research and which I’ve assimilated and modified here (see Figure 1). When you calculate IVS scores, it isn’t as simple as saying the highest score is best. You want to have the highest scores in the category that corresponds most closely to your business strategy and then have at least minimal levels of performance in the other categories. There also are some common category interrelationships that you would expect from specific business strategies, which are summarized in Figure 1. 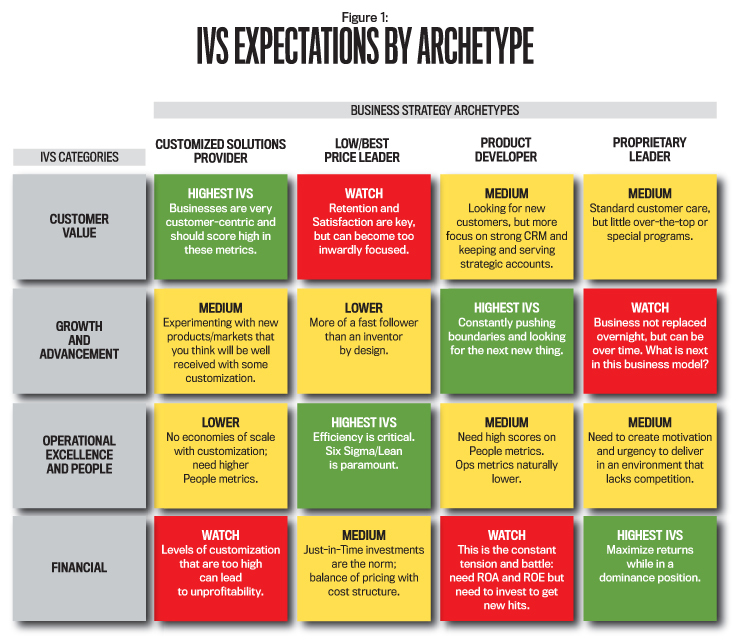 The four IVS BSC categories include a mix of 16 to 24 metrics, such as Net Promoter Score, New Products Introduced, New Markets Introduced, Customer Retention, Innovation Pipeline, and Free Cash Flow. The call to action around innovation execution and governance has never been stronger than it is today. As proof, there’s a great deal of research available that talks about how companies wish they could innovate more, better, and faster and create more value. A recent McKinsey poll quoted in a Harvard Business Review article by Gary Hamel and Nancy Tennant, “The 5 Requirements of a Truly Innovative Company,” stated that “94% of the managers surveyed said they were dissatisfied with their company’s innovation performance.” In addition, in Making Innovation Work: How to Manage It, Measure It, and Profit From It by Tony Davila, Marc Epstein, and Robert Shelton, 3M was quoted as saying that “Innovation is a survival issue.” Clearly, as businesses look inside their four walls, they aren’t happy and are feeling the pressure to innovate. But the really scary part of this call to action is what’s happening externally. To no one’s surprise, with technology and globalization as the critical innovation drivers, the world is moving faster than ever before. What used to be a 10-year window for reinventing your business and value proposition has shrunk to five years. Think about that—five years! While you may not have to totally reinvent yourself and introduce new breakthrough innovations and products every five years, if after five years you aren’t advancing your core value proposition, you’re going to be a shrinking business and less relevant. Sadly, your best days will be behind you, not in front of you. How are you reacting and adapting to this shift? You don’t need to be a Steve Jobs to facilitate innovation. Some of the best facilitators, enablers, and leaders of innovation come up with few ideas themselves, but they’re smart enough to know how to create the conditions for and empower others to innovate and be successful. Many of you have the inherent skills and experience within your company to be critical leaders, drivers, and supporters of innovation for your business. Put these skills to work today! 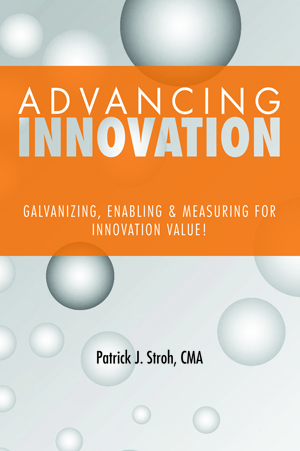 For more on innovation and innovation governance and measurement, see Advancing Innovation: Galvanizing, Enabling & Measuring for Innovation Value! available in the IMA store at www.imanet.org/IVS.